CherrySue, Doin' the Do: Imperium - Movie Review! Nate Foster is an FBI agent sent undercover to infiltrate a skinhead gang and find info on missing nuclear material. As the tension amps up lines become blurred and loyalties are questioned. While watching this I got the feeling that the director had a change of vision halfway through shooting; for the first 40 minutes there's lots of KKK imagery, then, after he meets the gang leader, it just cuts to a normal movie. 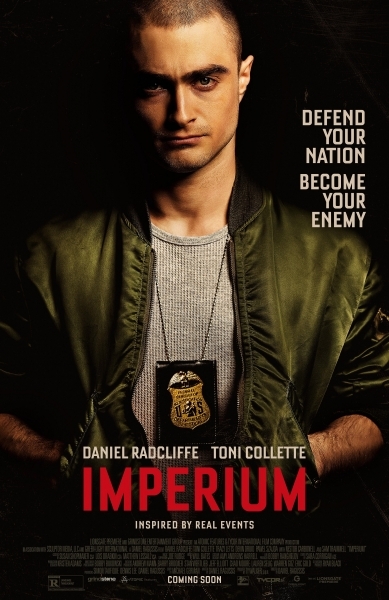 What was more surprising to me was that the tension didn't come from Daniel Radcliffe with the other characters - almost to the point where they could have cut the FBI scenes entirely and put more undercover scenes in, only for the FBI to be a twist and it'd still work. The tension came from the fighting between the different white supremacist groups, and the supporting cast made the film shine. 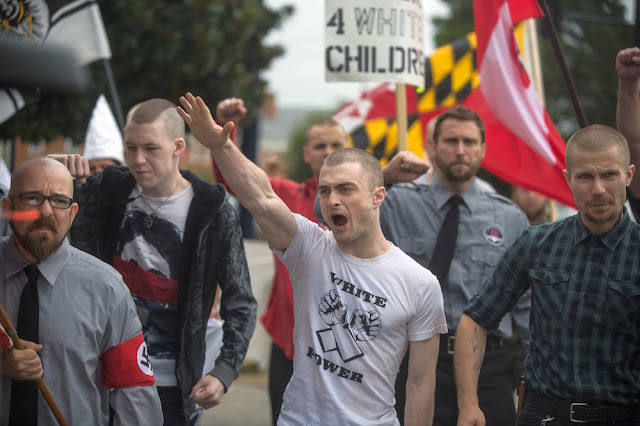 Daniel Radcliffe himself was decent, but he kept doing the Radcliffe thing where he gets flustered, looks down and swings his arms which just reminded me too much of Harry Potter that it got weird. I will say though, what seemed to be his quick thinking when he was almost called out by people really felt genuine and was well done. The stars for me were Chris Blackwell as the Aryan Brotherhood leader and Sam Trammell as a seemingly normal father who just, oh yeno, HAPPENS TO BE A RACIST TERRORIST. The scenes when the skinheads face off against the Aryan Brotherhood were fantastic, almost like they were about to start warring with each other at any moment. There are absolutely no punches pulled in this, but I think my biggest complaint about the film was that there are some characters left unresolved. These could have been sorted with just one or two scenes where Nate speaks to them - the scenes with the kids however were very bizarre and incredibly well done; they go from talking about a tree house to 'hiding from the mud people' in a breath and really make you wonder if people are really like this (spoiler: of course they are). I'd say that the film's ability to make you see these characters as people and not just scum is a testament to it's writing, and so is when you step back and find yourself thinking 'I didn't realise how bad it was while watching it'; and that terrorism isn't just ISIS or whatever middle-eastern group like most news reports recently. One of my favourites of the year so far (if not just for some of the sweet jackets and docs featured).